This chili is packed full of venison, beans and tons of flavorful smoky spices like chipotle and smoked paprika. It’s the perfect way to branch out from the usual ground beef! So the Super Bowl is coming up. And my team is out (wahhh). You know what that means? It’s all about the food. I mean, truthfully it’s really all about the food whether my team is playing or not. But when my team’s out, the food is pretty much the only reason to watch. Chili is one of our favorite football foods, of course. And it’s one of Nick’s favorite foods in general, so I make it pretty often. I’m always on the hunt for new chili recipes. Nick comes from a family of hunters, and lately they’ve taken a few hunting trips and come home with a few deer. So we were gifted with a bunch of frozen ground venison. Though Nick loves venison and any kind of game meat (he ordered antelope when we went out in Arizona on New Year’s Eve), it’s not always my favorite. I have a pretty discerning palate, and though I don’t completely mind the gaminess of venison, I’m not dying for that flavor either. Over the past few years, first living in Mississippi where Nick was always hunting and now living near my hunter in-laws, I’ve cooked a lot of deer. And my favorite ways to cook it include LOTS of flavorful spices to stand up against that gamey flavor. Chili is perfect for that! I went with a strong smoky flavor in this chili– using both smoked paprika and chipotle powder. (Did you know chipotles are smoked jalapenos?) It turned out really delicious, and while this spice combo is great with venison, you could definitely also make this chili with ground beef instead! 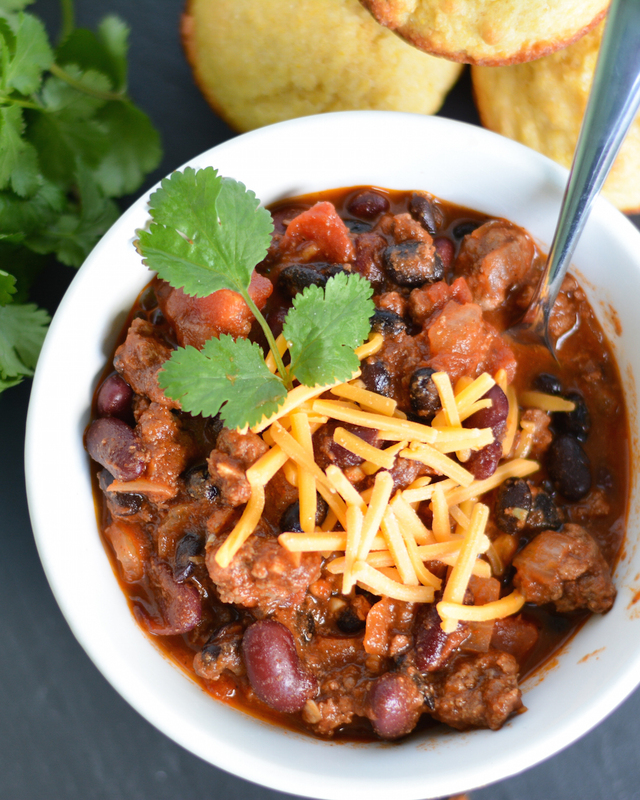 This chili is perfect for your Super Bowl party– or any chilly night curled up on the couch! Heat the olive oil in a dutch oven or large pot over medium heat. Add the onions and garlic and cook until beginning to soften, about 5-6 minutes. Move the onions to one side of the pot and add the venison, breaking it up with a wooden spoon or spatula. Cook until browned, about 5 minutes. Add chili powder, chipotle, cumin, paprika and salt, stir and cook 1-2 minutes until spices are fragrant. Add tomatoes, tomato sauce and beer, stirring to pick up any browned bits from the bottom of the pot. Add beans and stir to combine. Bring the chili to a simmer and simmer, stirring occasionally, 20 minutes. Serve with cornbread, topped with cheese, green onions and/or cilantro! What else are you making for the Super Bowl? How about this yummy Ginger Wasabi Snack Mix? And don’t forget dessert! How cute are these Krispie Treat Footballs!? I’m not a football fan myself so the big game is ALLLL about the food for me! 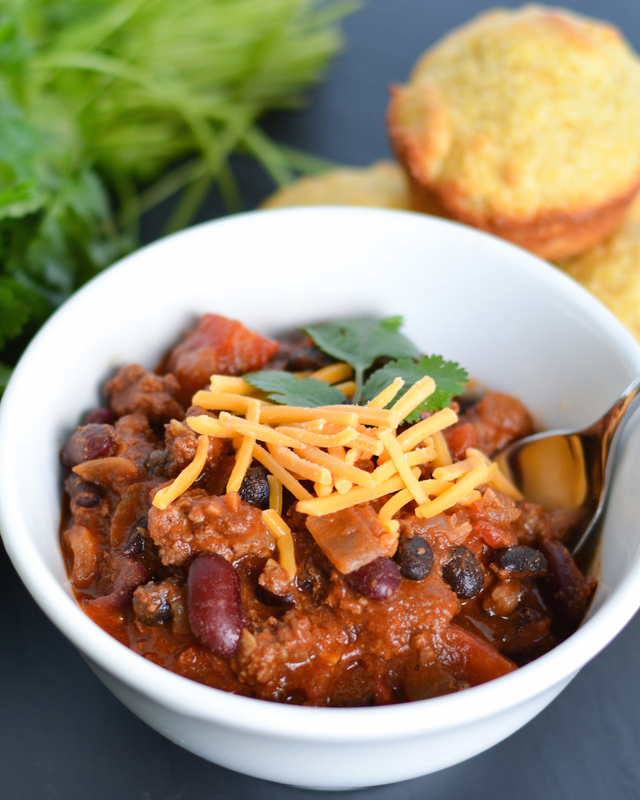 This chili is so perfect for the occasion, and I love that you used venison here! Yum! My new team is actually in the Super Bowl (North Carolina, since we just moved here I MUST cheer for them), so I’m kind of excited! And you can’t have a super bowl party without chili! LOVE this chili, Jess! LOVE LOVE LOVE that you used venison in here – totally doesn’t get enough love! This looks perfectly comforting and absolutely delicious! Cheers, girlie! Thanks, Cheyanne! I’m rooting for the Panthers, too, since I loathe a certain dopey QB on the other team… 😉 Looking forward to all the snacks next weekend! I am ALL about the food for every kind of sport since I’m not really a sports fan! And I would definitely devour this chili in no time. I’ve never tried a venison version before…sounds delish! Hehe yep! Bring on the snacks!! Thanks, Gayle! I’ve never cooked venison before and I wouldn’t even know where to start with it! Well I guess now I know 😉 Looks delicious and definitely perfect for game day! Oh I’m all about the food! I could eat chili year round, but especially in the winter of course. I’ve eaten venison a few times but I’ve never cooked it myself. Chili sounds like an awesome dish to use it in! Haha! I’m the same boat as you, Jess! My team is out so helloooo all the food. LOL. This chili seriously looks like the PERFECT kinda man comfort food—the carnivore guys in my family would be all over this! There is always venison in the freezer and I’m always looking for ways to use it. Usually we make a venison/beef meatballs, but I think I’ll have to give this a try. I’ll eat this while everyone else is watching the game! Oooh meatballs is a great idea, too! I’ll have to try that!! Thanks, Amanda! Jess I love anything everything with chipotle chilies in it & this chili sounds perfect for a lazy weekend!! Have a great weekend girl! Thanks, Ami! Hope you’re having a great weekend, too! This recipe is really similar to the beef and bean chili I make, too! Great minds…=) I’ve actually never tried venison, but a lot of my hunter friends tell me it’s delicious, so I may have to give it a try. It certainly looks awesome in these pictures! I tried this and It was really great!!!!!! thanks for this Hit of a Recipe!!!!! Definitely making this! What kind of beer do you usually use? Hi Lizzie! You could really use any beer you like. I might avoid an IPA or something really hoppy just because it make it a bit bitter, but other than that just use something you like! Lighter beers definitely always work but something darker is great too if you like those types of beers! Personally I use whatever is in my fridge, which with my hubby is always something different! We were given a pound of ground venison, and I feel the same as you about it, so I thought chili would be a good choice. Made your recipe today and my husband and I both really liked it, thank you.